On Thursday evening, I took the train over to Glasgow for the Scotlug meeting. There was an interesting presentation about phidgets. Afterwards I went along with the other geeks to the pub to grab something to eat and have a natter. I’ve even now seen an iPhone (not just in pictures), though not yet had a chance to play with one. After 11pm, I set off back to Edinburgh. On my bike. I could have taken the train, but that would have cost more and I was needing the challenge of cycling over night home. I headed North from George Square to the Glasgow spur of the Forth and Clyde Canal. I then followed the Forth and Clyde Canal, the whole way to the Carron Sea Lock, where I then hit the road for the rest of the way home (except the cycleway parallel to the A90 from Dalmeny to the Crammond Brig pub, where cyclists are not allowed on the trunk road). By the time I was nearing South Queensferry, first light was starting to show. See the picture below, where you can just about make out the towers of the Forth Road and Rail Bridges. The journey took 5 hours, and was about 53 miles in length. It’s not very often you’ll see me arriving home at 4:20 am. The greatest thing about cycling at night is that the roads are really quiet, especially after 1am. It also makes cycling on the bigger roads a lot easier, and saves you from having to use the quieter and hillier routes. It can also be faster as you don’t have to deal with other traffic or air turbulence caused by other traffic. I’d be quite happy to do it again, as long as I don’t need to get up the next day before lunch time. This entry was posted in Cycling, Edinburgh, Glasgow, iPhone on July 28, 2007 by smsm1986. Last Thursday I was in Stirling for a presentation in the morning. I took the train out, so that I was able to be out there for the start of the presentation at 9:30. Unfortunately as I was travelling before 10am and it was not yet July or August, I had to pay the full fare of £5.80, rather than get a third off with the Young Person Railcard. I’ll need to keep in mind that for the next 2 months, I’ll be able to get the discount even when travelling before 10am Monday to Friday. After the presentation finished at lunch time I cycled to Glasgow for a Scotlug meeting, where there was a presentation by Chris Fleming about OpenStreetMap.org. It took about 5 hours, including some time for a few breaks. Unfortunately there was some rain showers on the last half of the Cycle from Stirling to Glasgow. At one point it was so heavy that I decided to hide under one of the bridges that go over the Forth and Clyde Canal to let the heaviest of the rain to pass over. As it had been so wet, I decided to take the slow train home, otherwise I would have cycled through the night back to Edinburgh. This entry was posted in Canal, Cycling, Glasgow on June 30, 2007 by smsm1986. Yesterday I cycled 140KM (87 miles). I first headed out to Balerno along the Lanark Road, where I joined the National Cycle Route 75. I followed it as best as I could all the way into Glasgow. Along the Clyde I switched over the the National Cycle Route 7, which took me out to Bowling, where I took a break at the Bowling Basin/Harbour. Bowling is where the Forth and Clyde Canal joins the River Clyde. Unfortunately I managed to get 2 punctures from the rim side of the inner tube. The first around Coatbridge I managed to fix. After that I got all the way to Bowling and then start heading back along the Forth and Clyde canal. At the towpath access point for Kilsyth and Croy I got a second puncture in another place again on the rim side of the tire. I tried to fix it, but as soon as I got it all back together, I start to hear a high pitched whistle coming from where I just fixed the puncture. The tire was flat within minute. It was getting dark and it was still about another 20 miles to Falkirk, so I decided to head to Croy station and get the train from there back home for £6.05. It wasn’t all that bad, it seems to be the second most I have cycled in one day. Maybe I’ll get around to doing the trip again and set myself a new record for how far I can cycle in one day. 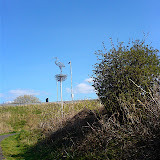 This entry was posted in Canal, Cycling, Edinburgh, Glasgow on April 29, 2007 by smsm1986. On Saturday I cycled from Edinburgh to Glasgow along the National Cycle Network Route 75 (except the bits where I missed some signs and got lost). Then to get back home I used the Forth and Clyde canal to Falkirk, where I switch to the Union Canal back into Edinburgh. This is the first time that I have knowingly cycled over 100 miles in one day. It took me about 12 and a half hours to get there and back. I was expecting it to take another hour or two to do the journey. Heading West took longer due to the head wind and getting lost a few times due to the National Cycle Network not being well sign posted in places and not having been in the area before. Going through North Lanarkshire isn’t particularly great on the bike due to the very high amount of broken glass lying around on the cycle paths. Livingston has some glass lying around in a few places, but it is no where near as bad as heading through the North Lanarkshire council area. This entry was posted in Cycling, Edinburgh, Glasgow, Union Canal on April 10, 2007 by smsm1986. On Saturday I took a cycle along the Union Canal to Falkirk and then the Forth and Clyde Canal to Glasgow. It was a total of about 60 or 70 miles. I timed it nicely for getting into Falkirk as I got to see the Falkirk Wheel turning. It was a really nice day for the cycle, with only a short shower of rain just after Falkirk. The great thing about cycling along the canal towpaths, is that it is fairly level all the way along the route. However, the towpath in places is very muddy. I took the train home from Glasgow Central to Wester Hailes. At £4.35 it was cheaper than going from Glasgow Queen Street to Edinburgh Park, which is more frequent, but requires a change to get there. This entry was posted in Cycling, Edinburgh, Glasgow on February 19, 2007 by smsm1986. Why not use hybrid trolley buses as an interim measure, until there is enough money is available to fund the laying down of the tracks. I would say that using hybrid trolley buses instead as it would be more flexible. They don’t always require electric to run, and they don’t need the expensive tracks. The Museum of Transport in Glasgow has a trolley bus from the 60’s, so it might be an idea taking a look at it. This entry was posted in Edinburgh, Glasgow, Trams on October 3, 2005 by smsm1986.